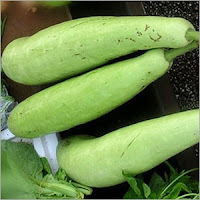 KSRealityBites: Bottle gourd (lauki) juice could be harmful! 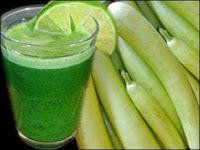 Bottle gourd (lauki) juice could be harmful! NEW DELHI: According to the latest survey, bottle gourd (better known as lauki in hindi) juice can be harmful for health. A CSIR scientist died after consuming bottle gourd & bitter gourd juice on an empty stomach in New Delhi. The 60-year-old scientist Sushil Kumar & his wife had been consuming the bottle gourd juice for more than four years to keep their diabetes in control. According to Dr. M P Sharma, Head of the Dept., Gastroenterology & Internal Medicine at Rockland Hospital, the couple had diabetes problem. But Sushil Kumar passed away after the consumption of bottle gourd juice, whereas, his wife complained of vomiting blood & severe diarrhoea, but had a narrow escape. The doctors conducted an endoscopy on his wife & found her entire stomach was inflamed. There were ulcers in her stomach. 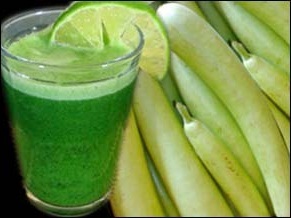 Dr. Sharma said the vegetables & fruits from the cucumber family 've harmful toxins called tetracyclic triterpenoid cucurbitacins compound, which is responsible for the bitter taste. However, the doctor suggests that old people having diabetes & other problems may go for bottle gourd juice removing the bitter part of the vegetable. Because higher levels of cucurbitacins compound causes harm to health due to either improper storage of vegetables or high temperature. Dr. Sharma said that the bitter parts of fruits are traditionally cut apart & not consumed. In case of vegetables, cooking helps to destroy such toxins. Doctors said that two more such cases 've been reported earlier in India — one at the Himalayan Institute in Dehradun & another from Ahmedabad. "Higher levels of cucurbitacins compounds are triggered by high temperature, wide temperature swings & also due to improper storage of vegetables," said a doctor. established professionals, Unaudited Government agency funding (GamblingResearch.org ), identity protected by Privacy Commissioner Office of Canada, (Jennifer Stoddart), unlimited funding (under the guise of research grants), PHD individuals linked with the patient (deter liability issues), patient diagnosed with mental illness (hospital committed events = no legal lawyer access/rights), cooperation of local University and police (resources and security); note the Director of Brock University Campus Security. This all adds up to a personal ATM; at the expense of Canadian Taxpayers! **The Psych convinces the patients fragmented family, 70 yr old mother, 10 yr old nephew and his divorced sister (who rented across the incredibly "swank" and "beautiful" home of Marianne Edwards ( ex-Brock instructor ) and her husband (lawyer)), to move in together. They comply and obey to the "Doctor's" credentials, contacts, and financial gifts. "Where" and "How" have the participants been receiving their (lavish?) incomes from the past 8 years? Government Agencies like http://www.gamblingresearch.org/content/research.php?cid=3370&appid=2561 (annual grants up to 500 k ) ? The link above takes you directly to one of their research teams. Lisa Root, ironically, met with me during the 2001 incident as a C.A.M.H. employee, who I was "encouraged" to meet. "Please comment in a few lines...It is a humble request to all the readers. Thank you"